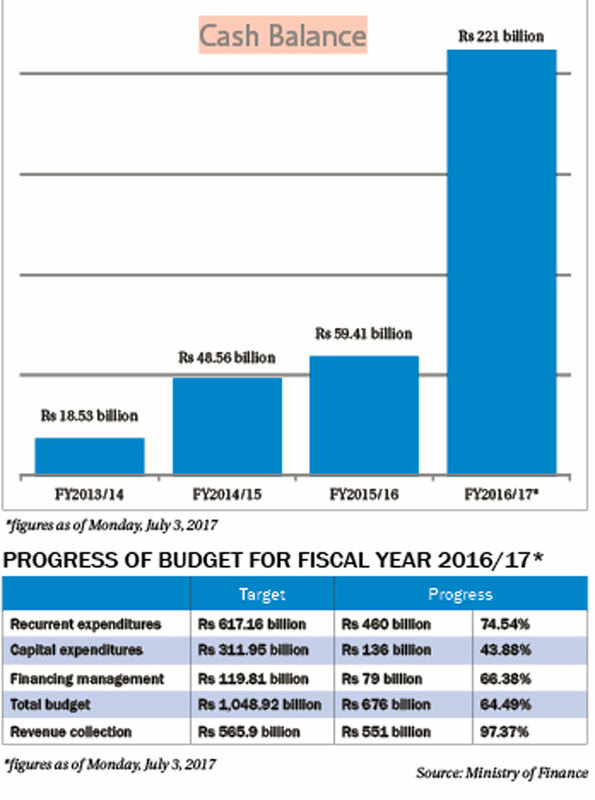 KATHMANDU, July 5: The government's treasury surplus has hit Rs 221 billion mainly due to its failure to spend. The huge treasury surplus has been attributed to the government's failure to effectively execute the budget, rise in revenue collection and carryover of huge cash balance from the previous fiscal year 2015/16. 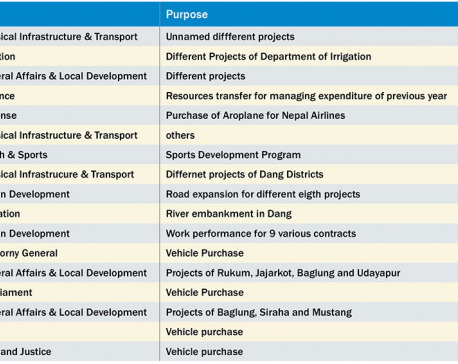 According to the Nepal Rasta Bank (NRB), the budget surplus, as of Monday, is more than two-thirds of the funds that the government had planned to spend in various development projects for the current Fiscal Year 2016/17. The government, in its budget speech for the current fiscal year 2016/17, has allocated Rs 311.95 billion for capital expenditure. However, it has managed to spend only Rs 136 billion, or 43.88 percent of the allocation, by Monday. While capital expenditure has remained disappointingly low, the government has almost met its revenue target set even though 11 days are still remaining in the fiscal year. As of Monday, the government has collected a total of Rs 551 billion in revenue compared to the target of Rs 565.9 billion. The combination of low spending and high revenue collection has sent the government treasury into surplus, according to officials of the Ministry of Finance. Last year, the government had transferred Rs 59.41 billion of cash balance to the current fiscal year from the previous year. The government estimates that it will finance the budget deficit of the current fiscal year partly through the cash balance which is expected to remain at Rs 102.73 billion. But, given that the development expenditure has been making very slow progress even in the second last week of the fiscal year and revenue collection exceeding the target, the government is likely to have far higher amount of cash surplus in the current fiscal year. As this is the last month of the fiscal year, the government is expecting to add revenue worth nearly Rs 60 billion in its coffer in the remaining 11 days. While the government has a poor track record of development expenditure, officials were optimistic about improving spending this year mainly due to timely announcement of the budget and slew of reform measures introduced to expedite budget implementation. 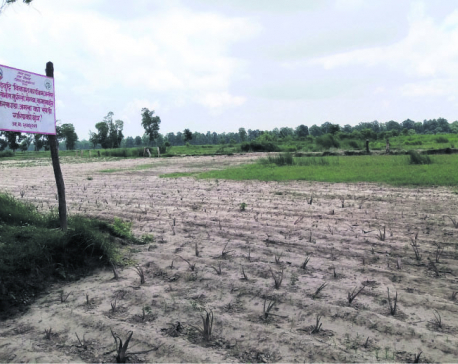 However, delay in budget approval, frequent strikes and political turmoil, land acquisition complication, and problem in public procurement, like in the previous fiscal years, affected public spending, according to officials. Economists question the capacity of the government mechanism to execute the budget, saying that the factors attributed for poor spending have not significantly crippled development projects. “Though there has been some improvement toward budget implementation in this fiscal year, the development expenditure figures suggest that spending is not substantial,” Ram Prasad Gyanwaly, the head of the Central Department of Economics, Tribhuvan University, told Republica. “Our mechanisms that are in place for capital spending is very weak and the bureaucracy of the country does not have strong capacity to execute the budget,” he added Gyanwaly. Last year, the government has achieved capital expenditure progress of nearly 70 percent. However, the government has justification for poor capital spending. Min Bahadur Shrestha, the vice-chairperson of the National Planning Commission, said development spending was affected due to election code of conduct. “As the local level elections were held in different phases, the code of conduct was in place for a long period. The government had to deploy many employees for election which also affected implementation of many development projects,” said Shrestha. “Also, laborers and contractors as well as many people went to vote in the polls which created shortage of human resources in the project,” he added. He, however, claimed that capital expenditure will cross 80 percent by the end of the fiscal year. “The figure of 40 percent that you are referring to is the financial progress of the development expenditure. However, there has been higher percentage of physical progress which has not been reflected in that figure as the checks have not been issued or the payments have not been reimbursed,” said Shrestha, claiming that the capital expenditure will reach 80 percent by the year end.